This is an Amicus version of Jekyll and Hyde, and one of Peter Cushing and Christopher Lee's 24(ish - it depends how you count) film pairings. It isn't generally very highly regarded, largely because of problems stemming from its production context. Writer/producer Milton Subotsky had managed to convince himself that he could produce a 3D effect on the cheap by keeping the camera constantly panning from left to right, but that turned out not to be true, and meanwhile the tussles over that took everyone's eyes off the core issues of plot and characterisation. Despite all that, lady_lugosi1313 and I both felt on re-watching that it's not as bad as people often tend to suggest. It has some really good sets and locations which are often very nicely photographed. Cushing is as crisp and professional as ever, and Lee's physical transformations into Blake (this production's name for Hyde) are excellent - although I'm afraid I felt that in his 'straighter' scenes as Marlowe (this production's name for Jekyll) he was rather dialling it in. The story also tries to engage directly and explicitly with the Freudian implications of the Jekyll / Hyde motif, although unfortunately the way that comes out isn't very logically coherent. Marlowe is supposed to realise that his potion is doing the same thing to all of his subjects, despite radically different results, but it also seems clear from other dialogue that what it is actually doing is destroying the super-ego in some people and the id in others - which isn't 'the same thing' at all. The behaviour of his Blake isn't consistent either. Sometimes he seems utterly self-confident and to take full pleasure in his crimes, whereas other times he is shamed when people laugh at his experience or seems guilty about what he has done - and it's not at all clear what make the difference in each case. In short, the script needed another edit for consistency and clarity, but I guess all the 3D kerfuffle is why it didn't get it. Seen a few times before, obviously, and reviewed in full here (LJ / DW). Rather like Scars of Dracula, I know it's one of the weaker films in the Hammer Dracula series, and as such I can tend to slip into thinking of it in the abstract as 'not very good'. But it is still a Hammer Dracula film, of course, so the effect when I actually watch it is usually to be pleasantly surprised. I do especially like the whole D.D. Denham business magnate set-up, which is absolutely logically what Dracula would do in a modern setting. Peter Cushing's confrontation scenes with his old academic pal Dr Julian Keeley (Freddie Jones) are very good as well, offering an extremely believable and well-conveyed sequence of stages of realisation and emotion on both sides as Keeley's story comes out. In fact, now I come to think of it, there is something both quite M.R. Jamesian and quite Tom Lehrer-esque about Keeley's character, as an academic happy to turn a blind eye to the dark implications of his work in return for the temptations of unlimited funding - not to mention disturbing resonances for those of us trying to negotiate the profession in the present day. 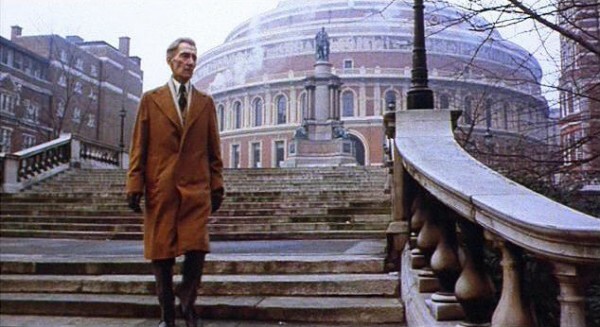 It also has some beautiful outdoor location footage of London, and especially of Peter Cushing walking past the Albert Hall. Taped off the telly and watched because it has Christopher Lee in it. This is pretty early in his career, but it's a very characteristic role for him. He's a police detective, operating as a right-hand man to an inspector named Peterson, and as such gets to be clipped and a little bit intimidating while wearing a fedora and pointing a gun at people. Sadly, however, he works in Stockholm (where the story begins), but after about half an hour of screen-time it develops into a chase up towards the Finnish border which he does not come along for, and so his character is absent from the rest of the film. The main tension at the heart of the story is essentially civilisation vs. nature. Though it starts off as a crime investigation into the theft of a crucial piece from a cutting-edge scientific invention (hence the involvement of the police characters), this is only really a ploy to get the scientist whose work has been stolen up into Lapland with a group of reindeer-herders, attempting to track it down. He himself says he has half-forgotten about the equipment by the time a few days have passed, and instead he is drawn into a world of reliance on reindeers and fending off wolves, where he loses his glasses (very symbolic!) and falls in love with a beautiful young Laplander woman. The fairly conventional story of love overcoming a cultural gulf which unfolds from here was given a rather icky edge for me by some dialogue about him needing to be convinced that the Laplanders aren't 'savages', and having this question resolved to his satisfaction when he comes across the young woman reading the Bible to the children in her care. I found that all too reminiscent of white colonialist missionary attitudes to countries full of non-white people. Otherwise, there's some nice footage of snowy landscapes, but much of this actually consisted of pre-existing film shot by the National Geographic Society - so you might as well just watch a nature documentary, really. The next item on my to-review list is a little bit special and I think needs a dedicated entry of its own, so I will stop there.